[Solved] How to make a shield effect (Guardian Shield) around a structure? How to make a shield effect (Guardian Shield) around a structure? I've tried to attach in events but didn't work. Shield should disappear when the structure's shields run out. The Model type actor determines the visual for the shield. 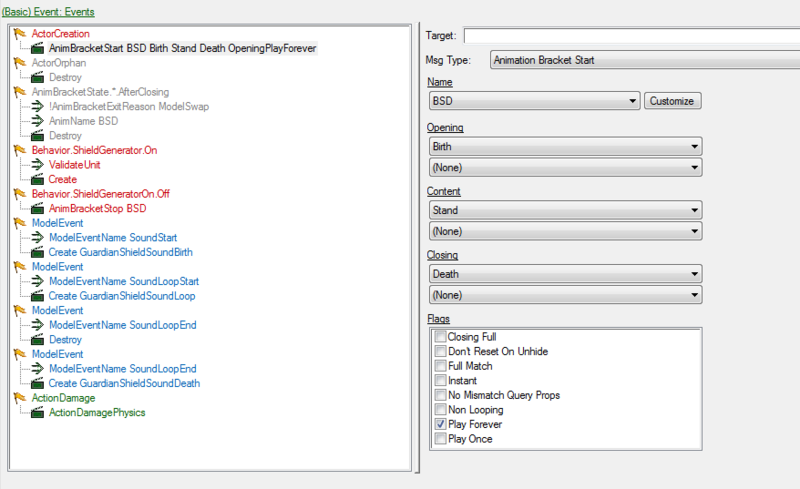 Just create your model when your effect/buff for the shield is activated and destroy it when it has finished playing the death animation after the removal conditions are met. 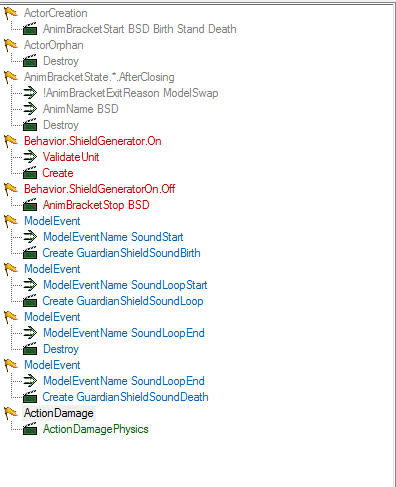 The Shield Generator behavior periodically runs a Create Set with a validator for "has shields". This set runs the Search Effect (for my shield generator's functionality) and an Apply Behavior. The applied behavior is called Shield Generator On. 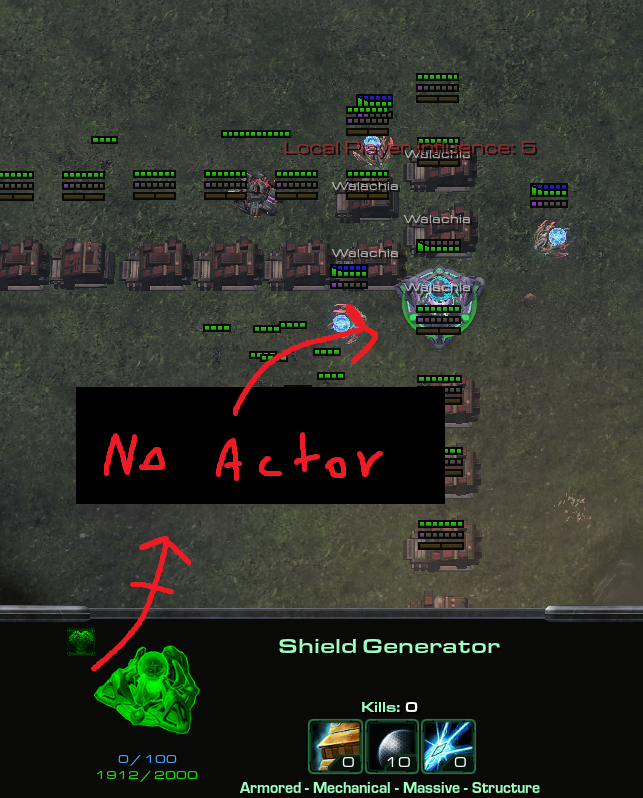 In the Shield Generator On Actor (copied from Guardian Shield) the actor is created when the behavior turns on and the animation stops when the behavior turns off. This works in creating a shield effect and removing it when the shield is destroyed. Even with Play Forever flag, the animation still stops after 35 seconds. Any way to slow it down so it would last let's say a few hours to make sure there would be no problems? 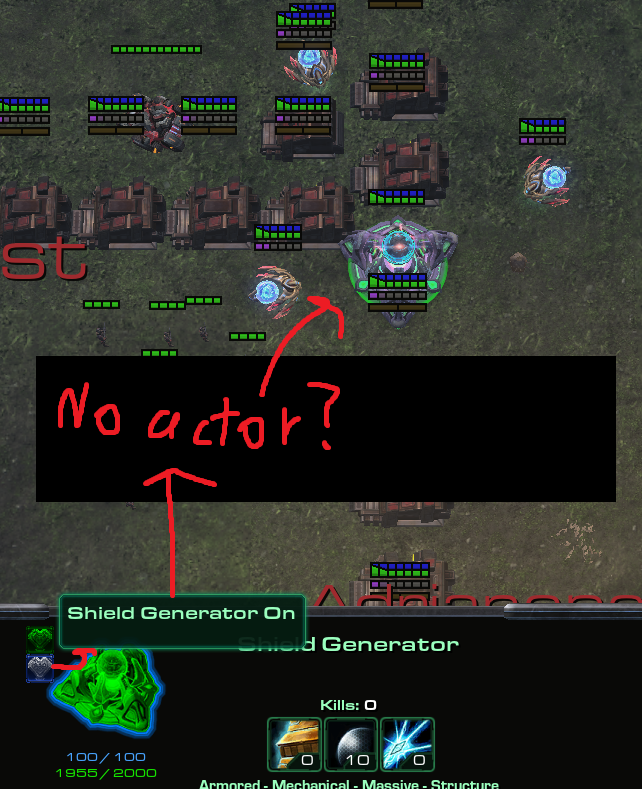 Marine doesn't come back after "shield on" behavior comes back but stays forever. Means something wrong with the way I create the actor in events and in the way I renew the animation? No, when the behavior is removed the model actor is removed. My point was that, unlike the shield actor, it doesn't just stop after 35 seconds even when it should be there. ShieldGenerator is the always running behavior which periodically runs a few effects for the shield generator, one of those effects creates ShieldGeneratorOn. 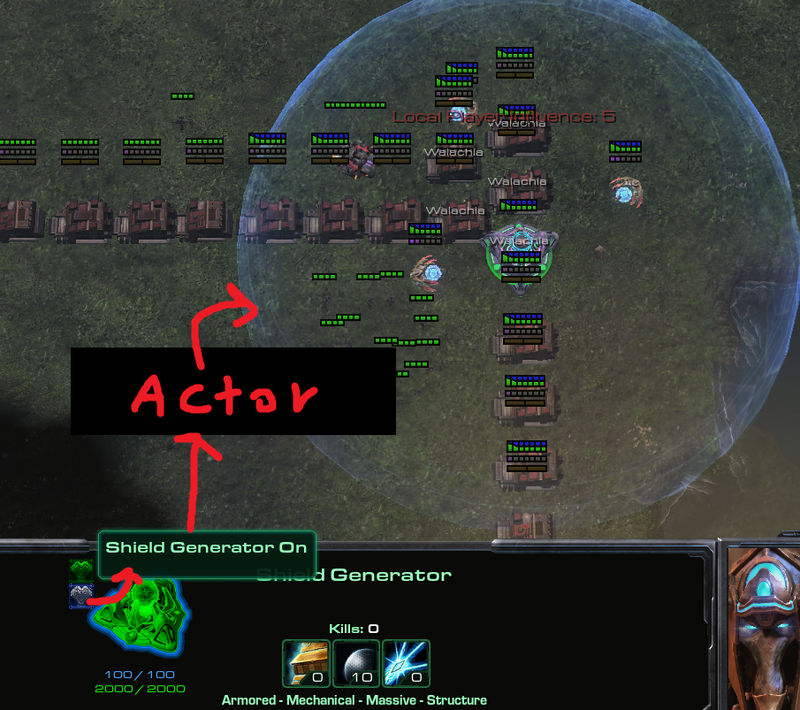 Only ShieldGeneratorOn should be linked to the actor and that's fixed now. As a result, the shield now comes back after being attacked. My only remaining problem is that the shield actor doesn't remain for more than 35 seconds. Looking at the shield generator in the cutscene editor, I saw the animation was 5 seconds long although I don't really know how the cutscene editor works. That fixed it, although it's now a static circle rather than more of a shield, I'm just glad I got somewhere with this.